Well christmas week fishing key largo is upon us… that busiest week of the year that is the kick start to our fishing season. Hooray! We had a little off time since thanksgiving, honestly about the slowest it’s been all year for this key largo fishing guide. But it was a welcome break, especially when in September and October your still fishing 20 days a month! I want to let you all know what to expect for the busy upcoming week here fishing key largo. It looks like we will be having warmer winds from the southeastern quadrant so it should be a comfortable mid-70s throughout. Wind speed doesn’t look too crazy… 10 mph average which should be fantastic! The water temperatures did cool this past weekend with the little cold front we had which is not a bad thing, it’s just what some of these fish need to spark to life! The spanish mackerel and company in the gulf love that, as well as the redfish in the backcountry, it may of well pushed some trout into some of the run-offs which we normally fish this time of year but have not done much of so yet due to the warm weather. 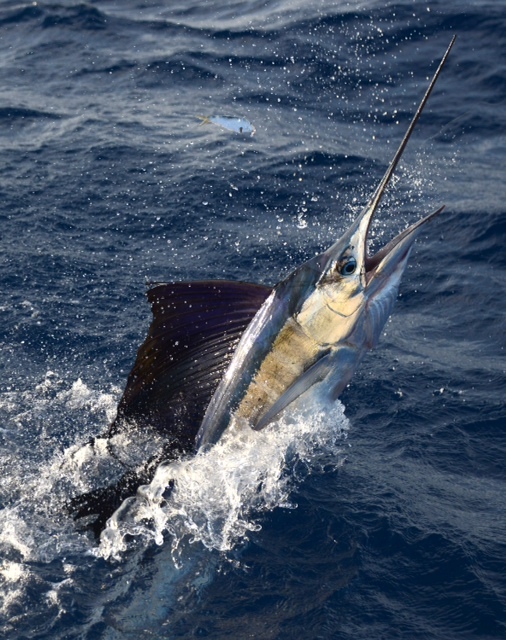 On the offshore side, the sailfish should enjoy the little cool down, and breeziness is never a bad thing fishing for them. Key largo reef fishing as well will likely spark up. Remember guides such as myself operate bay boats which can get you on the patch reefs this time of year – a perfect option for a half day. Your often fishing within 15 minutes of leaving the dock, and this time of year a plethora of fish is yours for the taking! If your thinking about key largo backcountry fishing, give me a ring… I personally look to be all filled up from christmas to new years, but if I can’t take you I can definitely find an experience guide to put you on some fish! Well I hope you all have happy holidays and a happy new year, I’ll try to post an xmas week fishing report… but if I don’t get to it I’ll see you on the other side of 2013!